Bogots.com may look like a genuine search engine, but regret to tell you this domain is part of a browser hijacker infection. Thus, if your homepage suddenly gets changed to Bogots.com, it means you have been infected with malware. There is no need to panic because browser hijackers do not lead to an ultimate system crash, at least not immediately. You obviously have to remove Bogots.com at once, but at the same time you should also check your computer for other potential threats that might be hiding in the depths of the system. Your computer’s security should be your utmost priority. This browser hijacker cannot be uninstalled via Control Panel, but that is not something unexpected. Browser hijackers seldom have entries in the list of installed programs. Also, Bogots.com affects Google Chrome, Internet Explorer, and Mozilla Firefox, thus having a wide circle of potential victims. It usually comes bundled with software packages, and users install Bogots.com on their computers willingly, although they are not aware of that. In fact, software bundling is a common adware and freeware distribution method, but sometimes it is also used by cyber criminals to distribute their malicious programs. Either way, it only proves that you have to be careful when you download freeware from unfamiliar websites. To be perfectly honest, we have seen similar infections before. Bogots.com is a Brazilian hijacker, and our security researchers have found that it is a direct clone of Pesquisa.ninja. 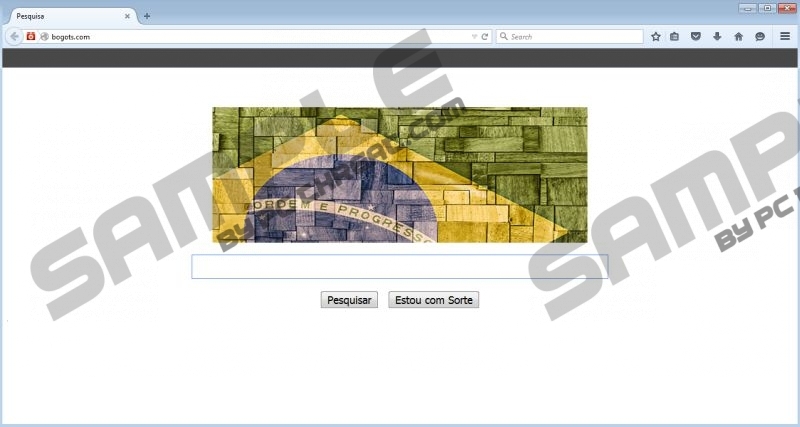 Take note, however, that although this browser hijacker is said to target mostly users in Brazil, you may also get infected with it, because malware infections do not recognize any national borders. If you visit a website that is involved in the Bogots.com distribution scheme, and you trigger a download that include the hijacker’s installation file, then you can be sure that your system will be affected by Bogots.com. The most dangerous thing about Bogots.com is that this browser hijacker is not liable for the security of the third-party content it displays. Consequently, it means that the domain and the search engine could be used for third-party content promotion almost by anyone. You are strongly discouraged to run any searches via this search engine because all the queries you enter will definitely be tracked and logged, and Bogots.com will monitor your online activity. What’s more, the search results presented by Bogots.com could be embedded with links to unfamiliar websites. You might feel compelled to click those links because they could have something that you have been looking for, but please think twice before you do so. Anything provided by this browser hijacker could lead to severe computer security issues, and you most definitely want to avoid those. You need to reset your browser settings to default to remove Bogots.com from your system, but it may not be enough to get rid of all the potential threats. This browser hijacker must have arrived with countless other adware and freeware applications that should no longer be tolerated. When you restore your browser settings, run a full system scan with the SpyHunter free scanner and then delete all the unwanted and potentially harmful programs the scanner detects. If you do not do that, there is a chance that Bogots.com could regenerate. Scroll down to the bottom and click Reset Settings. Quick & tested solution for Bogots.com removal.